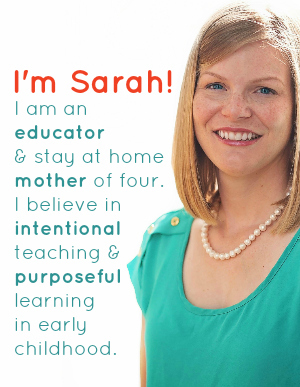 Due to the encouragement of my readers, I have decided to expand and elaborate on each step of how to write preschool lesson plans an entire year in advance in this four post series. 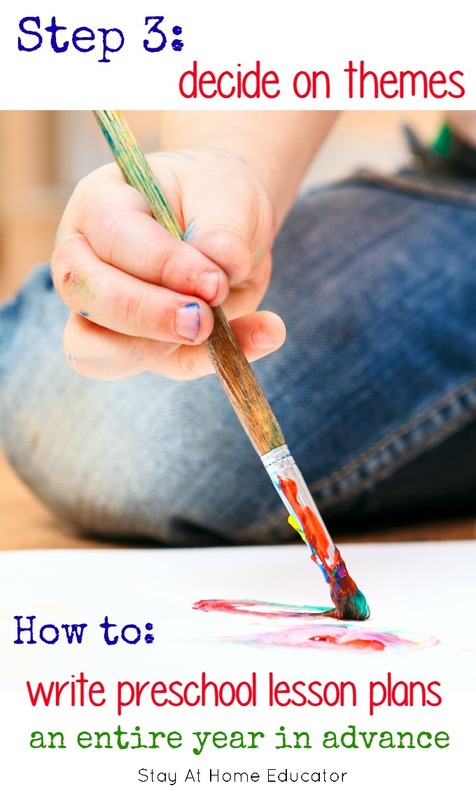 This is the third of the follow-up posts about how to write preschool lesson plans for an entire year. You can read my original post here. So by now you have created a calendar for the school year, and hopefully you have made a decision on how to teach reading and math. 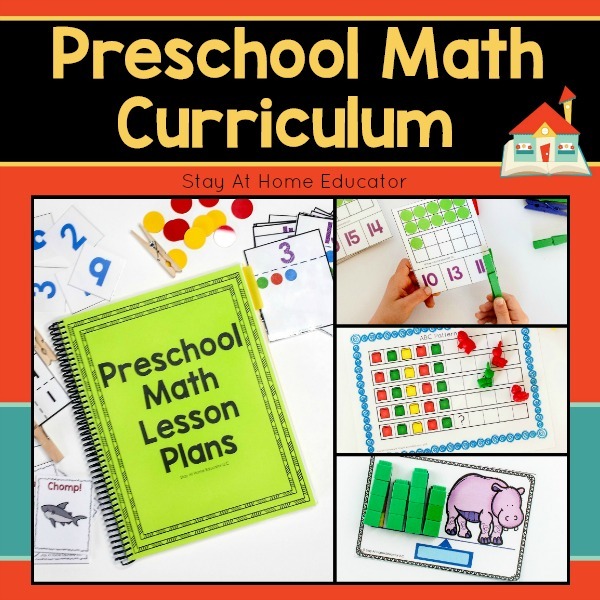 In yesterday’s post I posted four different templates you could use to create your own scope and sequence for math instruction as well as shared some of my favorite blogger’s preschool reading curriculum that can be purchased for a minimal price. Today, we will talk about selecting themes for the school year. Not everyone is a huge proponent of theme-based instruction. I personally am. I enjoy the focus they give to our exploration in the classroom and I love, love, love teaching the children with an “inch wide and mile deep” kind of attitude. Teaching with themes allows me, as a teacher, to facilitate my students’ learning so that they have multiple opportunities to explore a concept in depth. Some educators and educational methodologies suggest that the teacher should follow the interests of the child and teach according to where the child leads you. I agree with this, to a certain extent, but I also believe that it is ok to guide a child’s education and encourage learning in a specific area. So, my instruction is theme based. To prepare you for selecting themes, you will need to answer some questions (assuming that you will also teach themes). Will you teach monthly or weekly themes? I prefer monthly themes. To me, weekly themes require a tremendous amount of energy and time to prepare, both in lesson planning and gathering materials. However, some early childhood educators really prefer weekly themes. That’s fine. 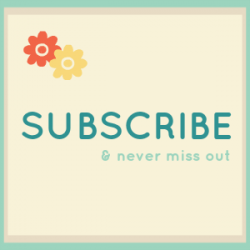 I will review with you how to plan for themes, and you can adjust for whether or not you would like to teach them monthly or weekly. One thing to consider about monthly themes is this: you can choose a broad theme, and then break the theme down into more specific themes by week. For example, this October our theme will be Farms. I have the choice to pull random farm related activities to support that theme, or I can narrow the theme down by the week. Maybe one week we’ll focus on what a farm has on it, maybe the next week we’ll learn about tractors and seeds, or apples (a traditional fall theme), and maybe one week we’ll focus on farm animals. I’m not telling! 😉 The point is, if you choose a general theme you can narrow instruction by the week, and even let your students’ interests guide those weekly themes. How do you select preschool themes before meeting your students? Let’s take a close look at this question. It is a very good one! If a goal of your instruction is to teach themes that are of interest to your students (because, let’s face it, learning is always easier when there is interest), how can you possibly plan in advance of meeting your students? This also applies to teaching your own children if you are a homeschooling parent. A typical school year in the United States lasts from mid-August to the end of May. That’s ten months of instruction. Think about your preschooler and how much his interests may have changed in the last year. Maybe a lot, maybe not. Either way, selecting themes needs to be done carefully and thoughtfully. When I consider themes for the school year, I take three things into account. I’ll briefly break down each item. As I stated in the original post about planning for the school year, not every theme is developmentally appropriate for the age. I cited the example of my bridges theme we did in my 4-5’s class in April. This theme was a huge amount of engineering fun as we worked together as a class to build and test various bridges using a variety of materials. We tested our bridges using glass floral pebbles to make them fall so we could determine what kinds of bridges were the strongest. We manipulated the height and the length to see if that impacted the bridge’s strength, too. My 4-5’s loved this! But, my little Corinne, who had just turned three struggled because she hated her bridge falling. She kept crying, “I can’t do it,” when she placed that final floral pebble on her bridge that caused it to scatter on the table. She struggled to understand that the purpose of testing the bridge was to actually make it fall apart so we could see how much weight it could withstand. So, a bridges theme may not be appropriate for a 3-4’s class, whereas it certainly is appropriate for an older 4-5’s class. 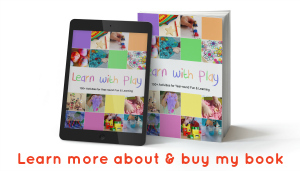 This is not to say that you cannot build and test bridges with younger preschoolers, it simply means that your planning will need to be more considerate of the age and you may need to do a bit more troubleshooting once you’re in the midst of instruction. Each of these preschool themes are broad enough to be broken down into sub-themes, that can be investigated on a weekly basis, if you choose. The final thing to consider are themes that are of a high interest to you. I strongly believe that you, the teacher or parent, must also have a high level of interest in what you teach. I use my own enthusiasm for a theme to get my students excited in the content. Have you ever had to teach something you were not excited about? I had an English teacher in high school who came to class one day and said with a sigh and a slouch, “Ugh, we have to learn how to write college essays.” She gave the class two very different examples to review and then assigned us to write our own essay. Guess what we did? Every student in the class, with the same sigh and slouch, chose one essay to basically copy, not word for word, but copied in content and style. Not much learning took place. My high school English teacher obviously didn’t like the part of the state curriculum that directed her to teach essay writing, and partly because of her lack of enthusiasm (and partly because of her lack of planning), her instruction was not meaningful to her class, and thus very little learning took place. It is so important that you be interested in the themes you select for the school year. Without a personal interest, you will simply not be able to teach with that “inch wide and a mile deep” attitude. Where else can you get inspiration for themes? Aside from the above three points, I get a ton of inspiration from Pinterest. The following are some of my fellow blogger’s Pinterest boards that are organized into preschool themes. First, don’t forget to check out my preschool themes page dedicated to all the thematic activities we do in preschool. Then, take a look at some of these Pinterest profiles. If you still need inspiration, simply search ___ preschool theme in Pinterest or Google. Sometimes themes will also be labeled as unit studies, too. How do you decide when to teach each theme? On my blog, under the tab themes, I have my preschool themes organized into seasons and holidays because that is how I tend to teach them. There is nothing better than teaching about spring when it is springtime, or teaching about the desert when it is blazing hot outside. Now, sometimes I do switch things up a bit and teach a theme in a less traditional time of the year. For example, last year I taught my ocean theme in the middle of winter. Sometimes winter is do dreary where we live that it is fun to take a break from the cold and pretend we are somewhere warm and sandy. The same can be said for winter. It’s a great amount of fun to learn about the cold and ice and snow in the middle of summer. Think of all the fun sensory activities you can do that will give the kiddies a break from the heat. You’ll find that some themes will fit nicely into your school year anytime, such as dinosaurs, construction, transportation, or fairy tales. How do you keep track of all the themes You want to teach? With an outline, or template, of course! I have provided them right here. Just click on the image to get your copy. This template is completely editable, too! That means you don’t have to print and write by hand. You can keep it all on your computer! Still thinking that maybe you’d like an example of writing thematic lesson plans? Or, perhaps you’d rather let someone like to do the work for you? No problem! Check out my month long thematic lesson plans here. 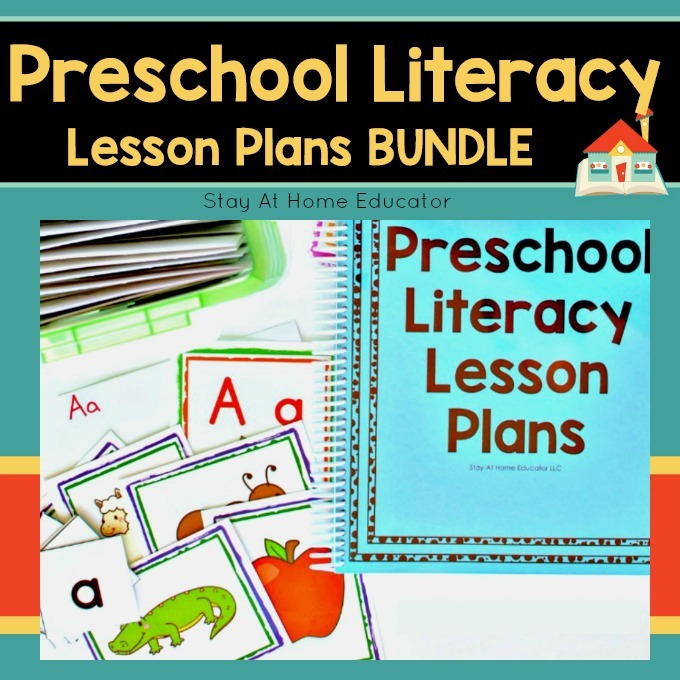 These also happen to pair perfectly with my Preschool Literacy Lesson Plans Bundle and my Preschool Math Lesson Plans Bundle. All products can also be purchased at my Teachers Pay Teachers store.